Bon Voyage little guinea pig! 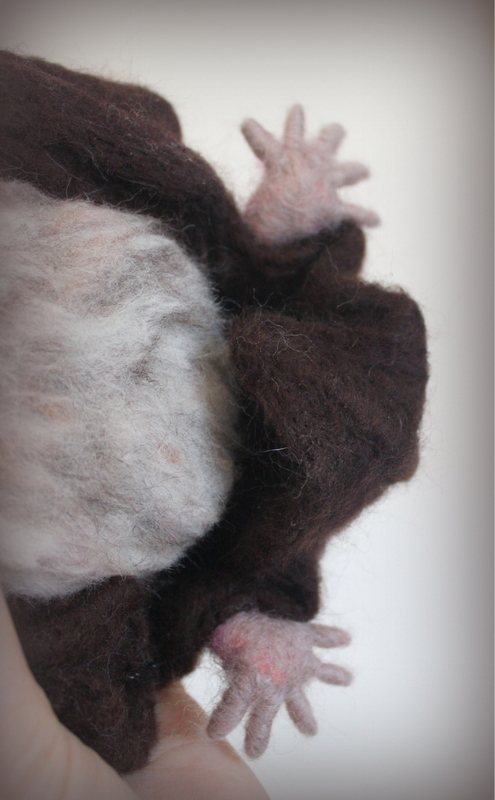 I would like to introduce you to a gorgeous needle felted guinea pig called ‘Teddy’. As you can see he has a cheeky little face and I really tried to make sure his autumnal orange fur tones ended up looking as fluffy and soft as possible just like a real guinea pig. 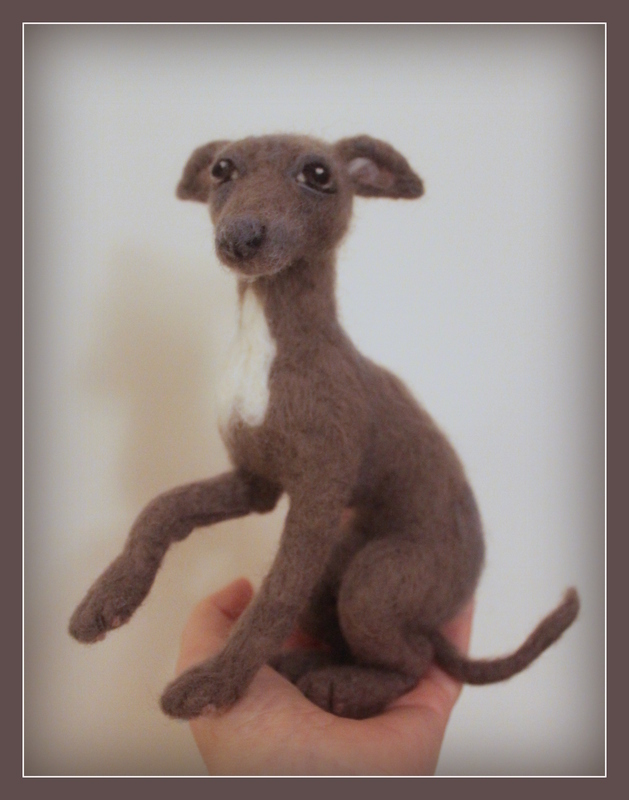 He is now on his way to France to live with a lovely lady who will take good care of him. His core is made of natural undyed Corriedale wool from New Zealand. His beautiful soft fur and detail on his cute piggy paws, ears and face are of soft merino wool (non-mulesed) from South Africa (Cape). 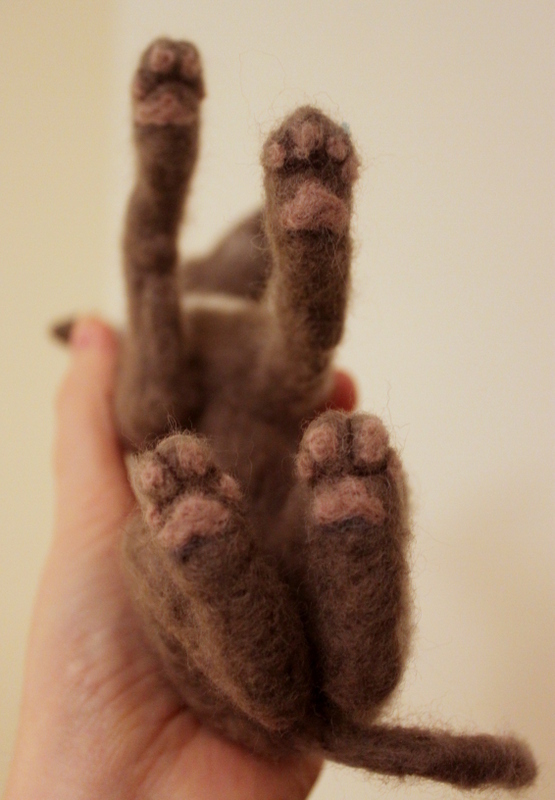 His toes have been sculpted by wool wrapped delicately onto wire. His eyes are made of wool too, so no glass or plastic. 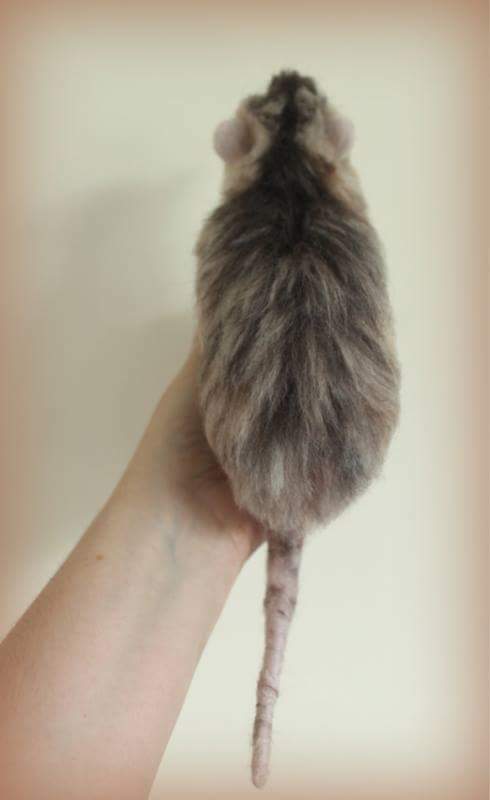 You can see he is life-sized from the close up of me holding him in my hand. 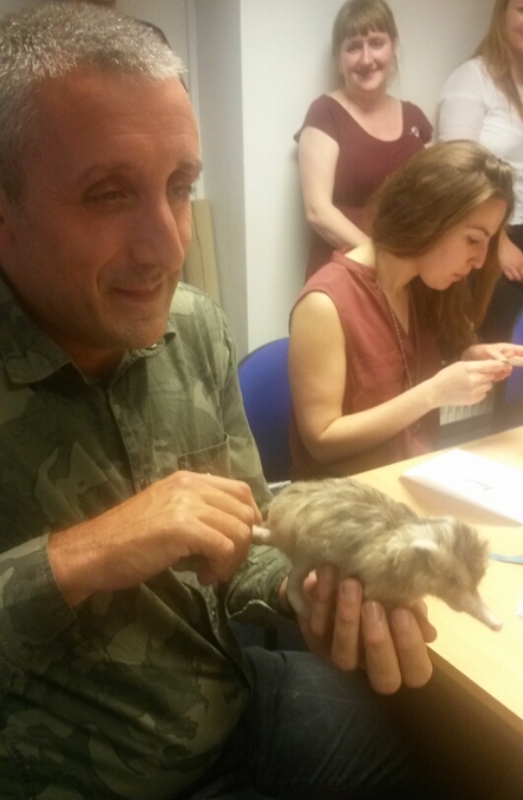 Would you like to know how to make a guinea pig? (click on the photo to get started). Here are some other needle felted guinea pigs for more ideas. Posted in Needle felt and tagged animal, felted, ginger, guinea pig, handmade, needle felt, tutorial, wool. Bookmark the permalink. 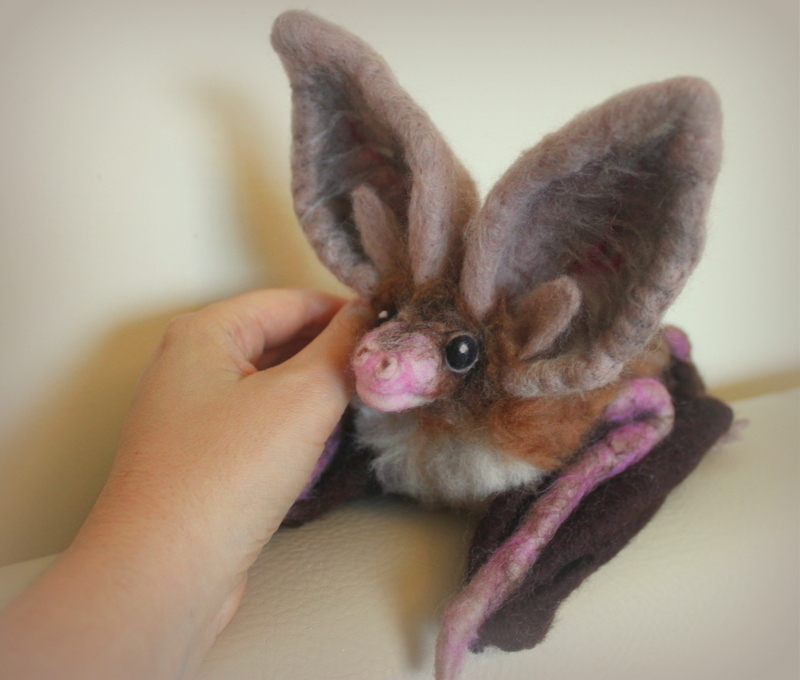 Seeing as I manage the National bat helpline (UK) as my day job it was about time I made a bat! 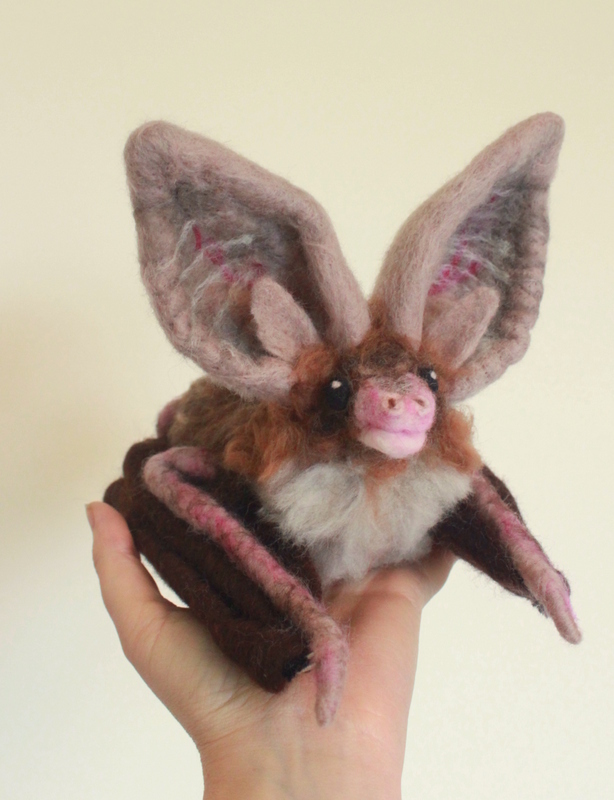 Thankfully I was asked to make this little brown long eared bat (BLE) (Plecotus auritus) – although when I say little she is very big compared to real BLEs which have a body length of around 5cm. 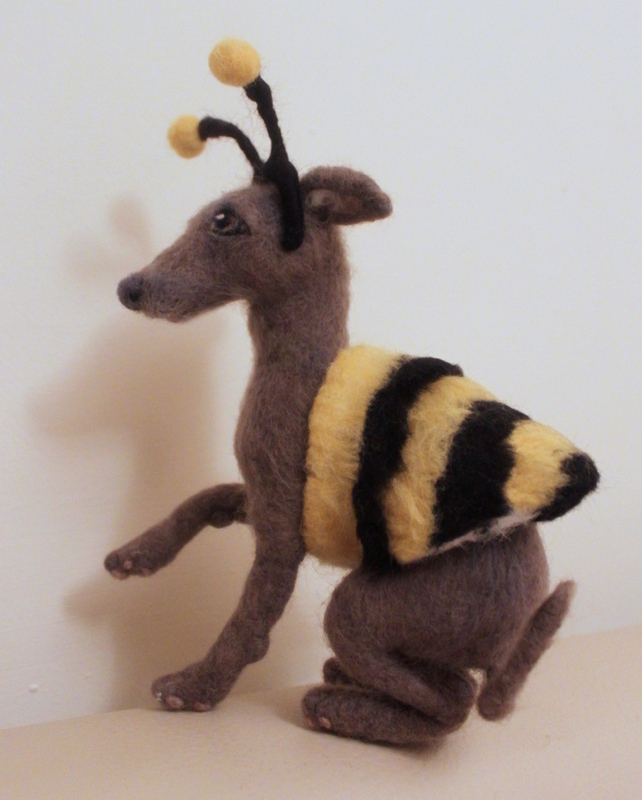 She was a challenge as not only did I have to work out how to make folded wings and a tail membrane but BLEs have such massive ears as you can see. 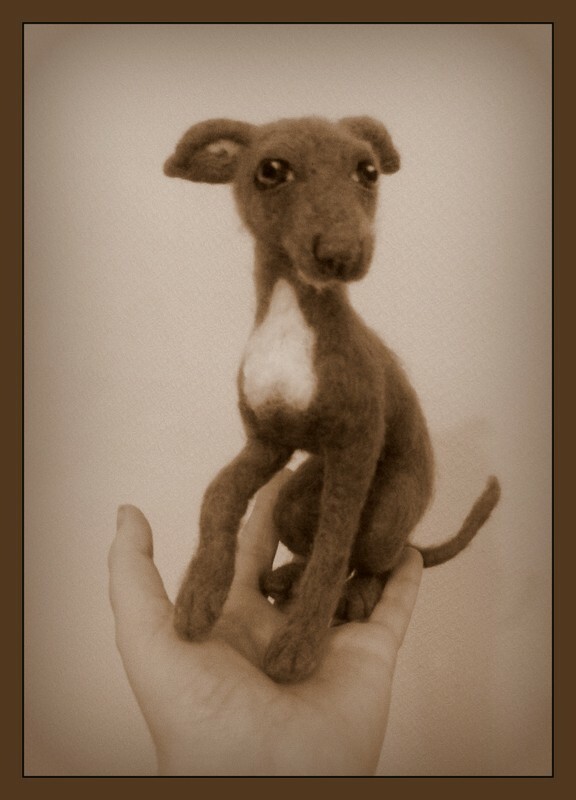 She is made of corriedale and merino wool and has wire inside her forearms, legs and ears. BLEs can live up to 30 years, eat thousands of insects each night, have only one baby a year and these fantastic huge ears help them to listen for prey as they glean them from leaves. 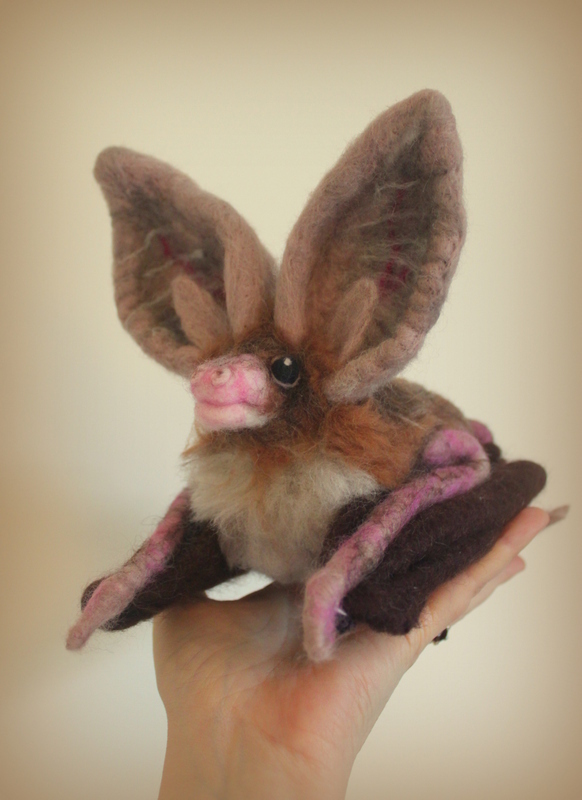 Posted in Needle felt and tagged animal, bat, British animal, ears, felt, handmade, needle, wool. Bookmark the permalink. My first Youtube tutorial ! 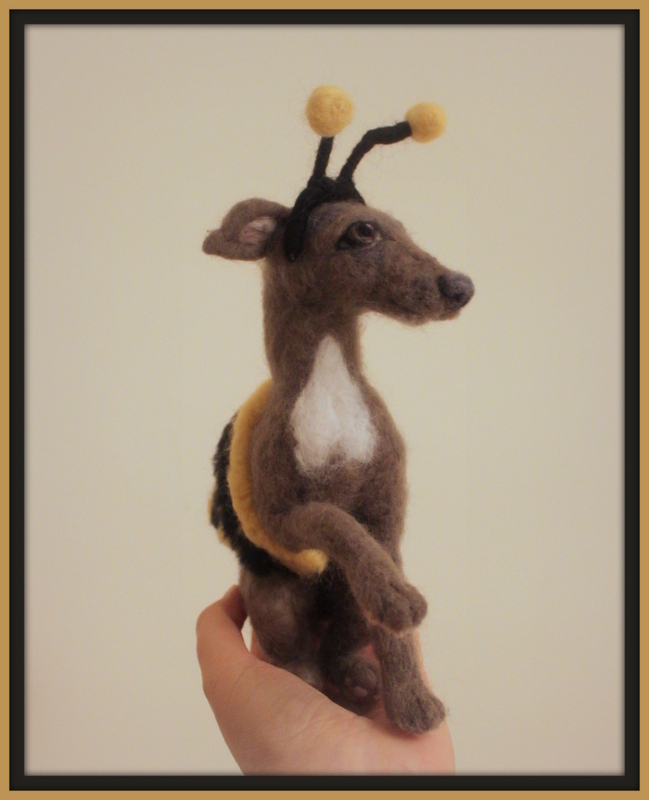 As you know I often take photos of my needle felted creations as I go along and have posted various tips and tutorials on my blog so you too can follow the same steps. However I have been wanting to do a video for ages so finally it is here! 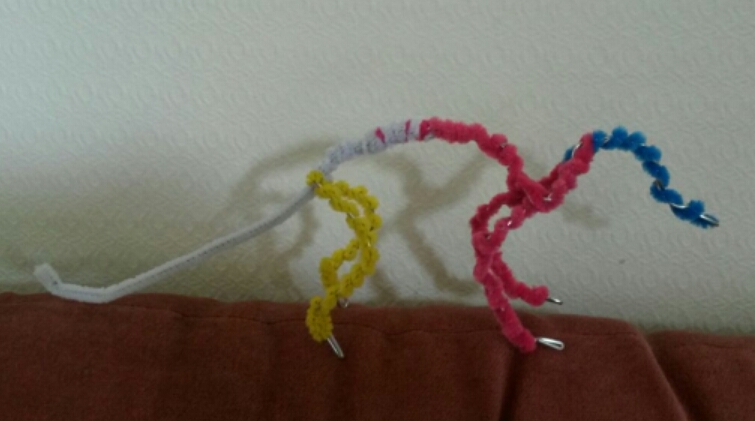 Whilst making the feet for the solenodon I used my Samsung s4 mini (hung from some string on a bendy lamp stand!) to video my hands as I shaped the wire and wrapped the wool over it. I used windows movie maker to edit it and added narratives and music. 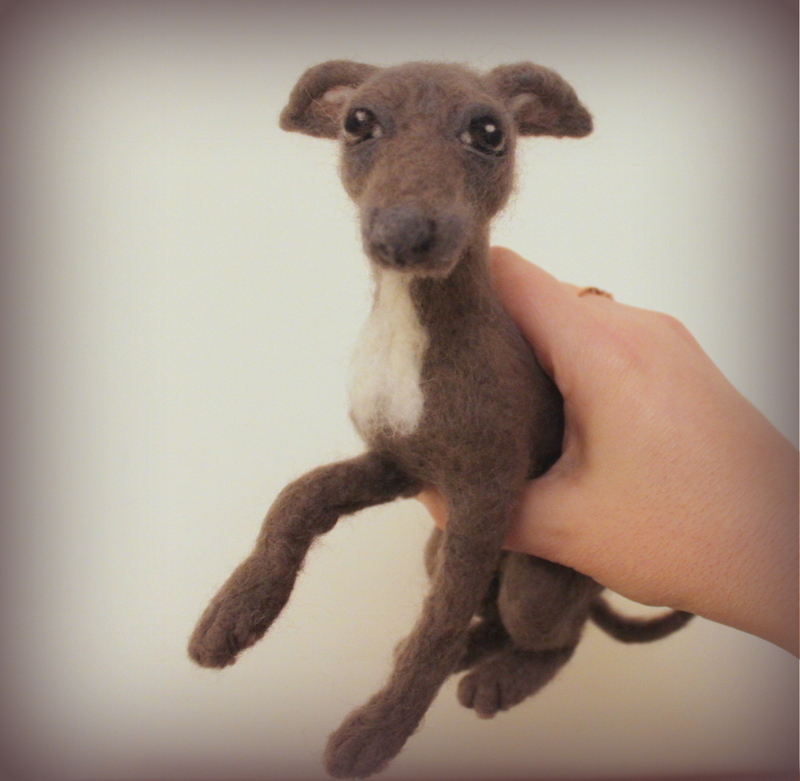 Not so impressed by the volume as my voice is not so loud if watching from a tablet or phone but I hope you can hear it ok.
Posted in Needle felt. Bookmark the permalink. 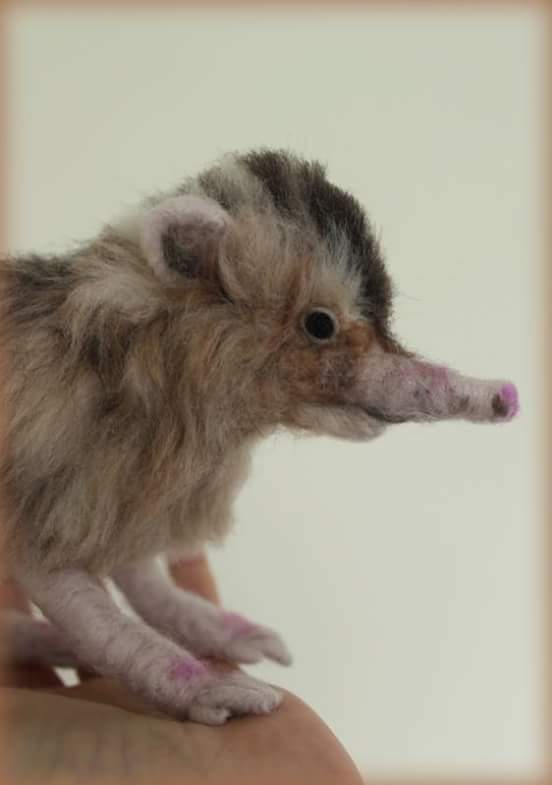 Ever heard of a solenodon? 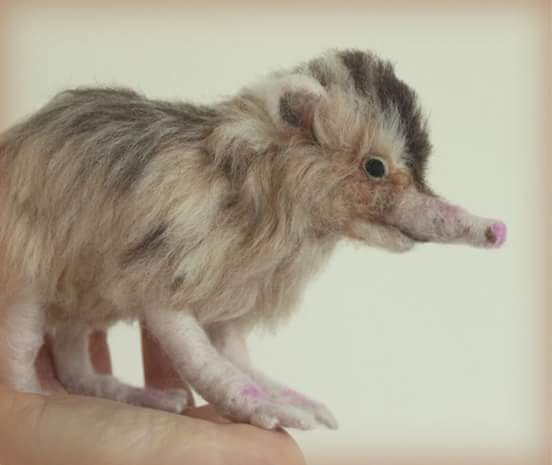 I had never heard of one until I came across this strange but interesting creature a few months ago when researching what to make my colleague for his birthday. I discovered that he had spent several years working on a conservation project for this intriguing animal in the Dominican Republic. As soon as I saw the solenodon’s shrew-like snout, shaggy dense coat, long clumsy legs and thick scaly tail, I couldn’t wait to get started. As this was a secret birthday buddy present though I had to keep quiet.. 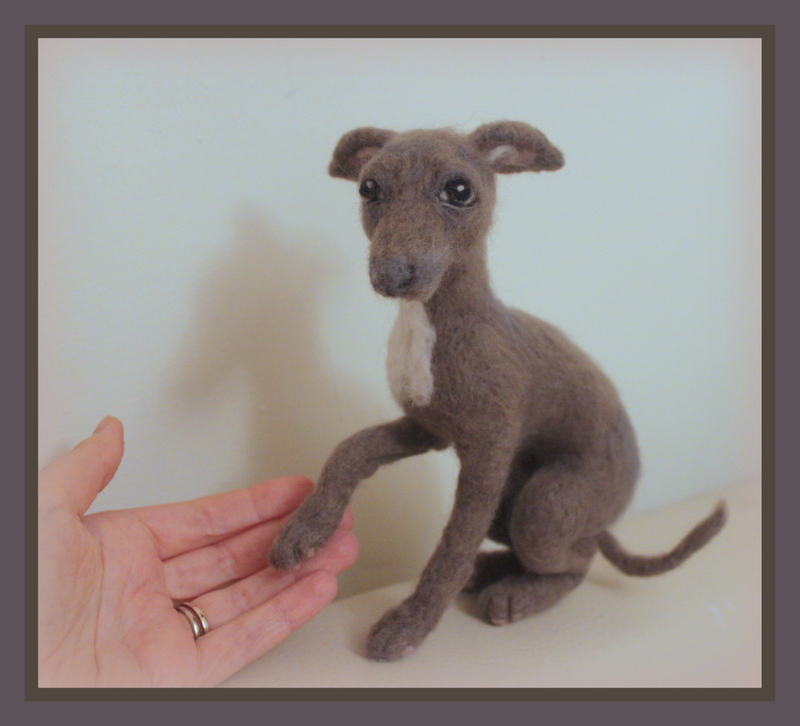 I started with a wire armature covered with pipe cleaners, then wrapped core wool (corriedale batts) over the wire to give him some shape. 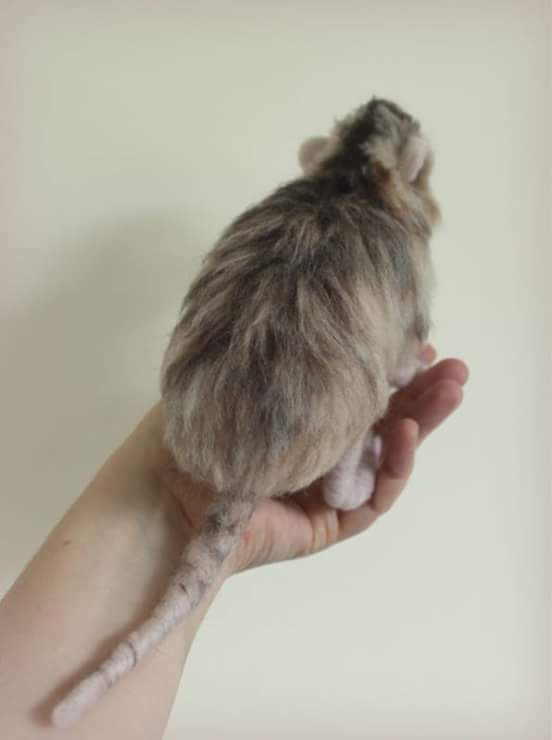 Then came the layers of luxurious merino wool for his cream fur with dark brown flecks over the top. 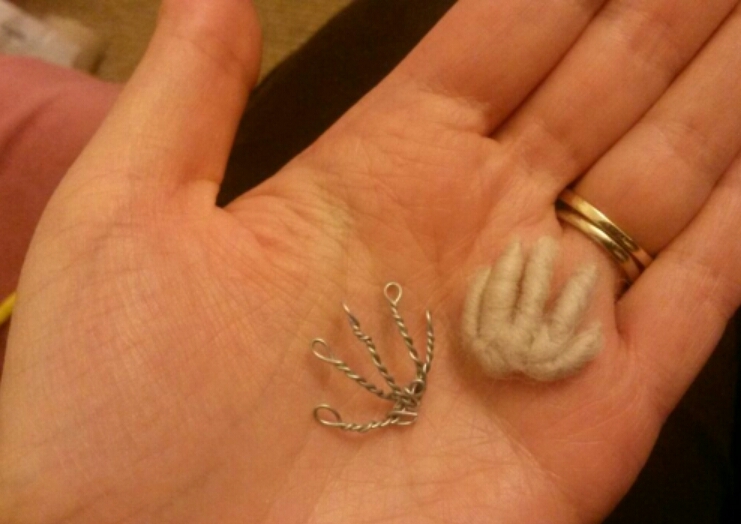 I also made tiny toes from thinner wire with merino wool wrapped over it. 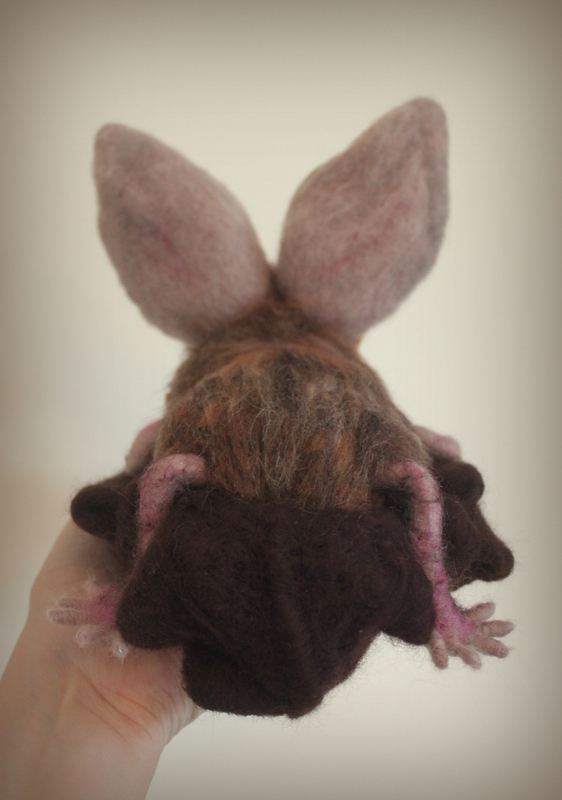 He has a lovely pinkish nose, ears, feet and tail and little black eyes to finish. 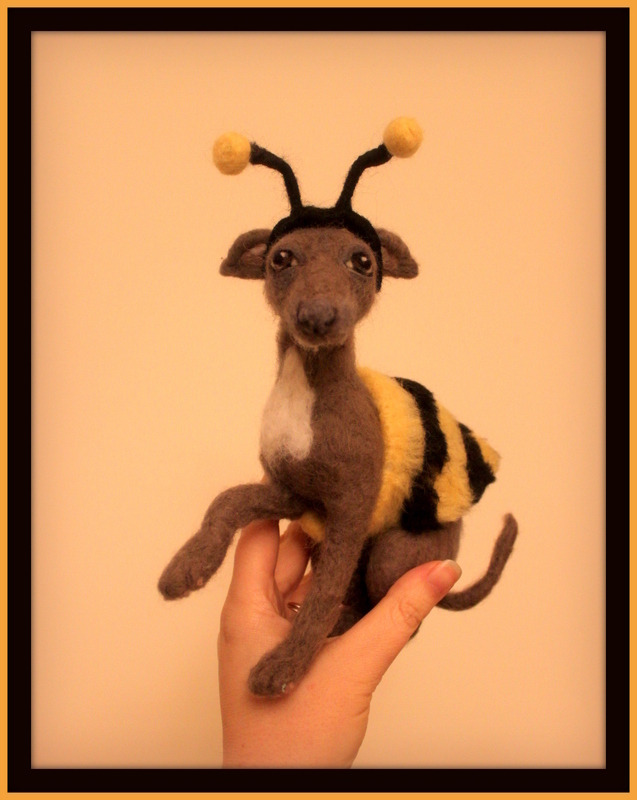 Not sure if many people have heard of this animal let alone needle felted one!! 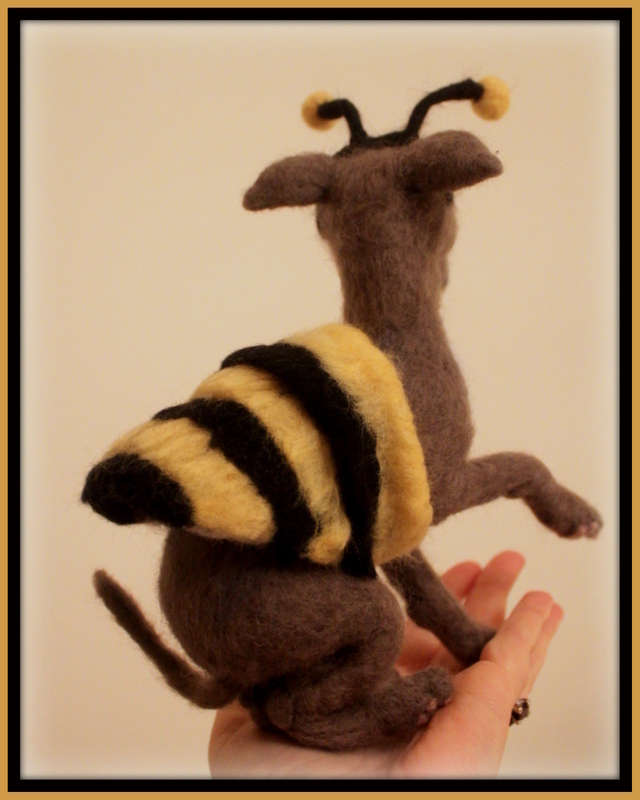 Creating an animal you know is so much easier – with this one I had to keep looking at the photos frequently to ensure I captured its build and character correctly. It was a lot of fun !! 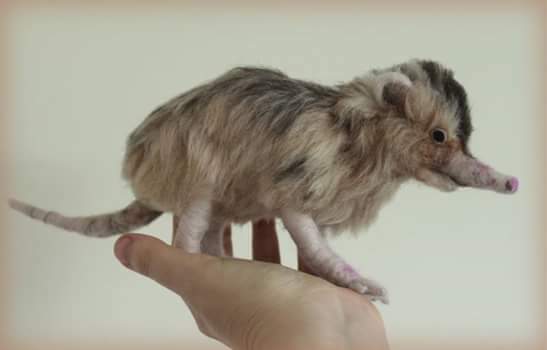 The real solenodon has a venomous bite – thankfully this one doesn’t! 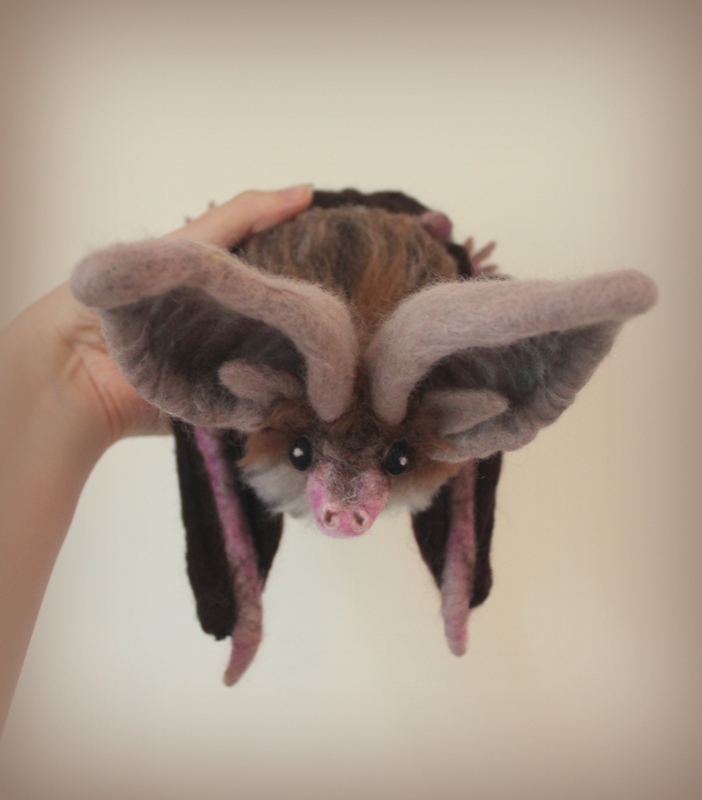 Posted in Needle felt and tagged animal, felt, handmade, needle, solenodon, wire, wool. Bookmark the permalink. I absolutely adore my mum. She is always there for me and whatever I say in a card or buy for her on mother’s day would not even come close to showing her just how much she means to me. Life has been extra challenging these last few weeks and she has lovingly sent me a text message every morning without fail full of encouraging words to inspire me and reassure me for the rest of my day. Although I have been full of cold this week and tired I wanted to make something beautiful for her as a glimpse of my appreciation for all that she is. 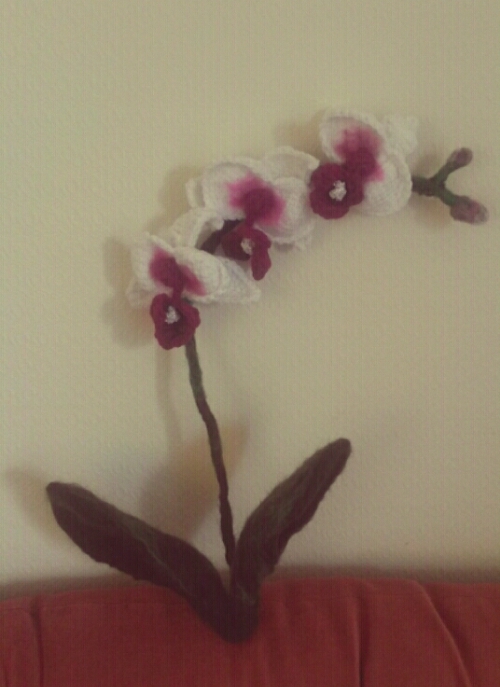 I managed to create an orchid from a combination of crochet and needlefelt. 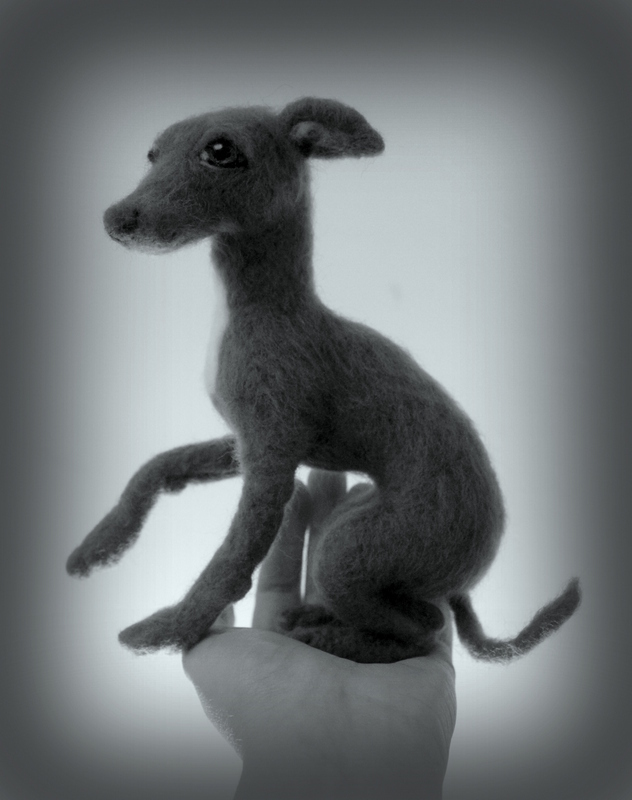 🙂 – something a bit different from my usual felted sculptures. 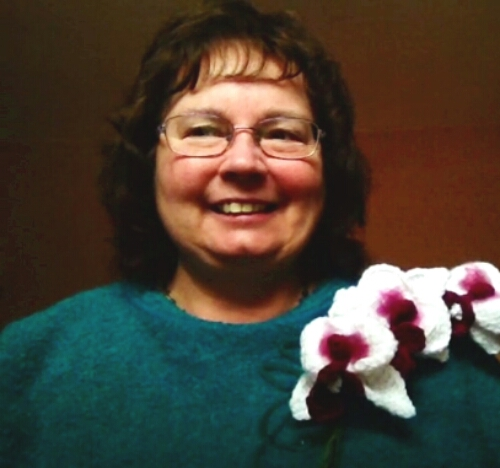 Real flowers often don’t last long and even orchids which can flower each year don’t always flourish. 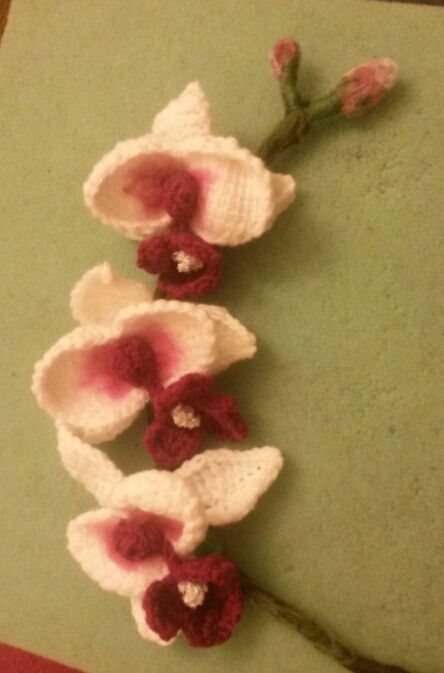 Wool flowers however will last so much longer and will still be there in years to come. 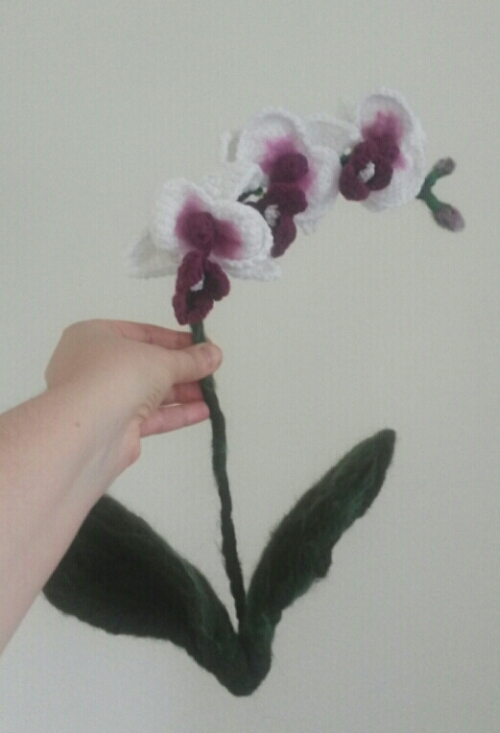 I followed and adapted a free pattern I found on line for the flowers, added a bit of felt to them and wired them to my own felted stem (with buds) and leaves. I watched her open her package this morning on the ipad. It was a privaledge to see her smile. 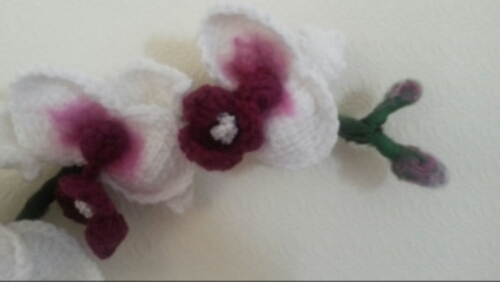 Posted in Crochet, Needle felt and tagged crochet, flower, mother's day, needle felt, orchid. Bookmark the permalink.